Plenty of talk about woodstoves here, and well warranted, but how about [electric or gas] cooking stoves? In trying to make the most of our space, and use fewer resources, we've been thinking about getting a narrower-than-standard stove/oven. Standard is 30" wide, and they come bigger, too. But there are also 20" and 24" models out there for apartments and stuff. The thought is that we don't often use all that oven space or stovetop space, and that, presumably, one would use a lot more fuel to heat the whole standard oven's volume (whether you're making a cupcake or ten loaves of bread) than you would in a smaller one. But I don't know if that's really true. And from my cursory search, the narrower oven/stoves don't look as high quality on the whole. Has anyone else wrestled with this question? Better yet, does anyone have experience they could share about smaller oven/stove setups? I had a 20" stove once and it fed a family of four just fine. I can't tell you if it saved money, but it would make sense. I found a used 30" gas stove (all pilot, no AC) for my yurt at camp. Works great. It is bigger than I need I think. I would have had no problem getting a 20" one. Unless there is a real strong reason to downsize, as in "There simply isn't enough room", I'd suggest staying with the industry standard width, the 4 burner 30" range/oven. There is way more room on top for juggling pots and pans, which makes a nasty accident due to stove top crowding less likely. Even then you should have an immediate counter on either side for most efficient use, preferably at least 24" as well. The cost will be reasonable, new or used. The difference in fuel use in a full size and smaller unit will be very negligible. I'm a carpenter and deal with these issues all the time. 30" and sideboard counter space is standard. Bob does make a point in one sense. You will find more options for things like counter tops, range hoods, etc. for 30" stoves. That alone will save you $$. Well, strictly from a product and materials perspective I don't have trouble making "smaller than normal" work. I'm more concerned with use. The two potential issues there are 1) as you noted, Bob, top space. Enough room for cooking dinner/four skillets of pancakes/canning and 2) enough room for baking most things. We're not a big meat family, so we're not going to be fitting a turkey in there. Six loaves of bread, or batches of cookies, or similar - that's possible. I feel like it's often the case that we are told "get the biggest, strongest product you can, because you might need it," and I am trying to move toward a tendency of getting what really suits my needs. Like buying a Ranger that would work most of the time instead of the F-250 that I may need on occasion. (That's hardly like the difference between a 24" or 20" stove and a 30" stove, but it illustrates the idea). We'd like to go smaller than standard on the fridge, too, and probably keep it outdoors, all in the interests of working toward uncluttering our lives. The small inconvenience of not having large cooking and storage space is worth it for the lighter feeling of the living space, in our experience. Have you considered maybe combining appliances then? Like a wood stove range? Not practical in the summer, but in the winter? If you like a small 20" or 24" stove, go for it. There's certainly nothing wrong with downsizing. In some of the new upscale homes I trim I'll occasionally see commercial grade Wolf or Viking ranges up to 48" wide and six HIGH output burners, and probably 12-15K pricetag. Usually there is a luxury pot fill faucet near the stove. Slide the pot across the 20K granite countertop and filler up for the Kraft mac and cheese dinner. lol Yup, ll the fancy amenities money can buy. Lemme tell ya a 30" Kenmore is dinky in comparison, just to give some perspective on what we here in America call standard size. 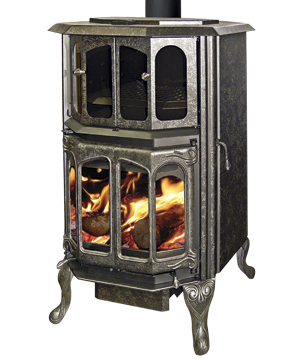 If your still interested in having a wood stove, and want to consolidate woodstove with cooking stove there are a lot of great options for wood burning cook stoves. This is just one site offering a lot of choices. and cooking. It has a small oven, and small cook top. Just figured I would offer a possible alternative to traditional stove options. Hey Ineffable- welcome to the site! We are hoping to get into wood cookstoves eventually, but it's baby steps for us right now, trying not to bite off more than we can chew. That looks like a great site for resources, though. woodstoves. Some do it regularly, some for big meals, some none at all, but some cook inside the stove in dutch ovens and skillets, which I thought was pretty sweet. We ended up getting a True North by Pacific Energy. When it's up and running I'll give an update here.